The postal industry is arguably among the industries that have been largely tested by the advent of the internet and mobile technology. Today, digital disruption has affected nearly every aspect of the postal industry. This has resulted in the development of new products and services that have improved customer experience. Emails and online e-commerce, for instance, have threatened the profitability and growth of the industry almost rendering it obsolete. Customers nowadays are less eager to send money orders and inland parcels. According to statistics from the Communications Authority of Kenya (CAK), postal and courier sub-sector revenues dropped to 4.5 billion Kenya Shillings from 4.6 billion Kenya shillings reported in the financial year 2016/17. Similarly, according to the same report the number of letters posted locally in quarter four recorded a decline by 10.7 per cent to 14.2 million from 16.0 million letters registered in the previous quarter. The report attributes the decline to competition from Posta’s more technologically adept rivals and Internet affiliated devices. For an industry that has for long relied on traditional practices, the digital demands have forced the postal industry out of its comfort zone and hence cannot afford to remain complacent. The main question has been whether industry players consider taking the disruption as an opportunity to reposition or fall victim to it. 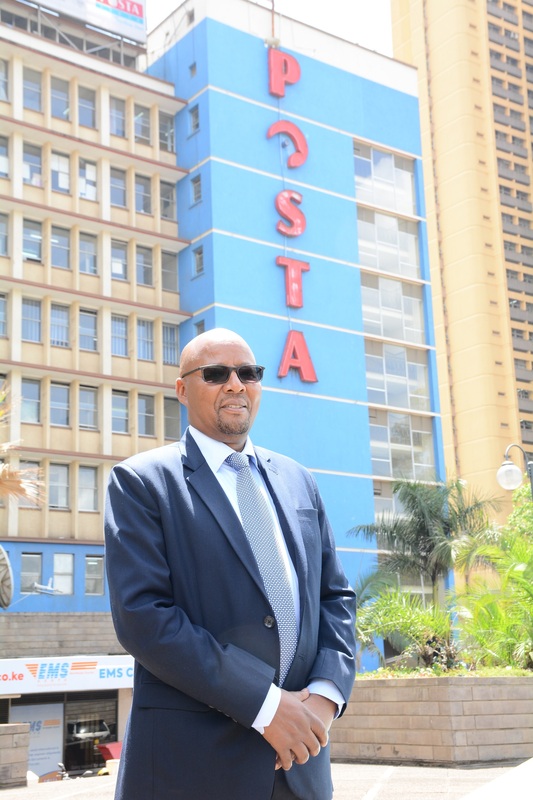 Faced with these challenges, Posta Kenya’s Postmaster General, Mr. Dan Kagwe has worked to find potential growth opportunities for the Corporation, a task he says has been one of the toughest. “Postal Administrations worldwide are embracing technology and Kenya cannot be left behind,” says Kagwe. PCK, grounded on the principle of providing affordable and reliable postal solutions has engaged in various business models tailored for the digital era. The aim has been to shake off its old-fashioned tag and embracing current technological advancements. This is as it seeks to rope in the new generation of customers and while at it double its revenues. “The future of the Postal Industry in e-Commerce, Financial Inclusion and in providing Logistical Solutions for last mile delivery cannot be understated. The global Postal network of over 600 outlets worldwide is a huge infrastructure which has the power to spur on e-Commerce, Financial & Social Inclusion,” Says Kagwe. PCK works under the Universal Service Obligation (USO) with an engraved vision of becoming the leading global provider of Innovative Postal and related services with its vast network of distribution and collection centres of 625 post offices spread across the country. The population served per Post Office is over 70,000. “Our overall goal is to improve penetration levels by expanding the postal network to meet the Universal Service Obligation which requires that 6,000 persons be served by one post office,” Kagwe says. Kagwe notes that the Corporation has the capacity to provide excellent Distribution and Logistical services to both the Government and Private sector. Currently, Posta Kenya has over 500,000 boxes installed countrywide, which he indicates has capacity utilization at 90 percent. With the widely pondered question on the relevance of Post Office in this era of electronic mail, Kagwe asserts that the Post Office is still very relevant, pointing out that the Mail Service contributes to 70 percent of PCK’s annual turnover. Corporate correspondences that include legal documents from the Judiciary, admission letters, bank statements, certificate of incorporation, and vital documents such as log books, title deeds, driving licenses and academic certificates, are among the key revenue earners and require physical delivery by the Post Office. When he took over the helm in July 2016, Mr. Kagwe has to rebuild confidence in PCK as a brand. He is further looking to transform the Institution into a prosperous, competitive Corporation. After incurring a loss during its financial Year 2016/17 of about KSh 1 billion, the Corporation ploughed back. Revenue in the year 2017/2018 improved. PCK recorded an annual turnover of KSh 4.1 billion reducing the loss by a figure of less than KSh 80 million against its yearly operating expenditure. September this year, PCK effected an exemption from value-added tax (VAT) that effectively made it cheaper to rent postal boxes. This saw the number of people renting the boxes grow albeit marginally. PCK has managed to revamp and utilize the 630 branches in Kenya that had been severely underused in a bid to attract business from various service providers especially banks. The corporation also ventured into Clearing and Forwarding business. The new foray into the business, Kagwe says has enabled PCK to sustain its workforce and further boost its revenues riding on its countrywide infrastructure. “With our customers spread across the country, we have identified the need for a seamless importation process by providing Clearing and Forwarding services and full logistic solutions to customers, importing items through Posta Cargo services,” he says. To push for financial inclusion to the unbanked in the remotest of the region, PCK also rolled out Agency Banking. This is through a partnership with several lenders looking to bank on PCK’s national and extensive reach to grow business without the need to put up brick and mortar branches. “Posta rolled out Agency Banking with five banks on board including Kenya Commercial Bank, Co-op Bank, Diamond Trust Bank, Barclays, National Bank of Kenya, the integration of Family Bank and Equity Bank among others, are at the final phase and look forward to operationalization before the end of the year,” he says. The corporation also signed a deal with the country’s election body, the Independent Electoral and Boundaries Commission (IEBC) to offer Clearing, Forwarding and Distribution services of the election materials, for the 2017 General and repeat elections, to all the 290 Constituencies. This, he says, gives certainty to the customer and rules out the risk of a failed first-time delivery. “More interesting is the concept of setting up hubs at strategic and convenient locations for temporary storage of consignments before collection by the customer,” he notes. Other platforms PCK works with include Mpost, Posta Mobile Wallet, Tunza Nyumba na Posta, EMS2GO and E-njiwa. The Postal Service has further begun leveraging its vast network and is eyeing partnerships with Amazon Web Services and Alibaba to help local traders and retailers import into the country through their platform and benefit from the last mile delivery logistical services. Furthermore, Kagwe notes, the key role of the Post in the e-Commerce chain is last mile delivery to the customer, and in the face of growing competition in the delivery sector, he says PCK is also providing a payment platform as other ways to profit from e-Commerce. “Our key competency is delivery, the combination of e-Commerce and Logistics will enable Kenyans to shop online and then the Corporation will handle the logistics, delivering the purchased items to peoples’ doorsteps,” he adds. The Corporation also partnered with Kenya Literature Bureau with the Ministry of Education which saw Posta distributing books to schools nationally in January and February this year. Under the Big 4, the Government wants to achieve Universal Health Coverage, improve manufacturing, affordable and decent housing, and food security. The Postmaster General believes the Corporation could play a very crucial role in helping the Government achieve these goals. Already PCK purchased 22 vehicles locally assembled at General Motors and DT Dobie to enhance sales and service delivery. “This is in line with Government policy of supporting local manufacturers to create employment,” says Kagwe. Also, he notes, the Corporation plays a key role towards the provision of affordable Universal Health Care through distribution and logistical solutions to pharmaceutical companies countrywide on a need basis. “Through our EMS Courier service Pharmaceutical drugs are distributed throughout the vast network countrywide. The Corporation has already migrated the entire workforce of 3,000 employees to NHIF super cover that was effected on 1st July 2017,” he says. In regards to Food and Nutritional Security, Kagwe asserts that in order to boost food security, the PCK has distributed Agricultural inputs to farmers countrywide, through its nationwide network. “We also facilitate third-party payments to farmers particularly in Western Kenya and Rift Valley Regions.” For Affordable and Decent Housing the corporation through the Postapesa product has provided payment solutions to real estate firms, contractors and other beneficiaries. Kagwe’s unwavering quest has seen Posta partnering with a number of organizations, Corporations and e-Commerce businesses to establish mechanisms for seamless delivery in the country. Tasked with his 2016/19 fiscal review projections, Kagwe is optimistic that Posta’s fortunes will double pointing out that as e-Commerce continues to explode, the same technology that took a huge bite out of first-class mail volume by letting people email for free might actually provide the way forward for Posta. Kagwe has worked extensively in the private sector including the Financial, Courier, and Logistics industry in Kenya and the wider East African region for over thirty years, specifically holding senior-level capacities at FedEx, Henkel Kenya, and Diners Club International. He believes his tenure is projected to steer several Postal Innovations which are already bridging the gap between the young and the old through consumption of Postal products and services. In his capacity as Postmaster General, Kagwe has been responsible for a number of significant actions that grew revenue, reduced costs, and improved cash flow. As he sails his second year in office, He is determined to put his stamp on one of the toughest jobs in the country.